Last Friday was Jack’s tenth birthday. As you can imagine, there was lots of excitement surrounding this milestone, lots of planning and playlist-making and cake research. The wily coyote even smirked and said that since he was turning double digits, maybe he should have two cakes. Uh huh. But once Friday arrived, the day turned bittersweet for me. On my way to drop Joey off at his Student Council meeting in the morning, I learned a boy in our town, Nicholas, had passed away in the early hours of dawn. And it was also his birthday. Nicholas surrendered to a neurodegenerative disease he had been battling for the past seven years. Plagued with seizures and hallucinations, he fought valiantly as this mysteriously rare disorder attacked all of his body’s functions. Between Jack’s birthday and Charlie’s First Communion, we had a busy weekend ahead of us. With Wolfie as my co-pilot in the front seat, I spent most of Friday running errands—picking up the ice cream cake and party plates and, in keeping with our family’s birthday tradition, balloons to tie to the mailbox. But as I drove through town with my checklist of things to do, my thoughts returned again and again to Nicholas and his family. People commented they found it tragic, sad that he passed on his eleventh birthday. But to me, the stilling of Nicholas’ soul on the same day he first breathed life is achingly poetic. I did not know this family well. We saw them around town and at baseball games; Joey and Nicholas were in the same class together in fourth grade, by which point Nicholas was in a wheelchair and nonverbal. One time they hosted the end of the year party for the Little League team because it was raining too hard to have it on the field. I knew they also had a younger son, but so far our paths had not crossed at school or the karate studio. I went to Hannaford’s to pick up Jack’s ice cream cake—“Mom. The Oreo one, get the Oreo one. It serves fifteen people.”—and standing before the freezer I smiled to myself, thinking about how Jack calculated the number of people coming over and looked up the cake online to make sure there would be enough. And as the numbers tumbled around in my own mind, there will be seven adults and eight kids that’s fifteen; they rearranged themselves into a different pattern. Just a few miles away from us, a family that was once four is now three. First there were two brothers, now there is one. I’d spoken with Nicholas’ mom a handful of times, and during each of our brief conversations, she struck me as calm, serene. But underneath her quiet demeanor I could tell there was a will of steel. Over time we became Facebook friends, and after a while she invited me to her private group. So, in the way of social media, I became connected to their family through updates and photos, posts and comments. From what I understand, Nicholas was a normal, happy little boy up until he was about four years old. And then he started to have seizures and hallucinations and other symptoms of something going terribly wrong inside his small body. For a year the family raced from specialist to specialist, desperate to find a reason that their son was having trouble seeing, talking, and walking. Eventually, a diagnosis: Batten Disease. A rare and incurable twist of genetic mutation and fate. The family started an organization called Our Promise to Nicholas, and they held golf tournaments and Easter egg hunts and road races to raise awareness and funds for research. In doing so, they increased consciousness about statistics and symptoms and treatments. Time and time again, they invited us into their personal world of seizures and struggle, hope and faith. Ultimately, this family of four taught us what it means to put one foot in front of the other every day, even in the face of despair and panic. They proved to us that a little rain won’t stop a bunch of Little Leaguers from having their pizza party. In the days leading up to Friday, there had been posts indicating that Nicholas’ condition was worsening. The seizures were increasing and Hospice was called in, and the entire town held their breath in prayer. When I learned on Facebook that Jack and Nicholas were both born on May 9th, I couldn’t stop considering how a random twist of fate and genetics landed us a 9-pound, 3-ounce boy with spectrum disorder, and them a 9-pound 3-ounce boy with an incurable neurological disorder. And over and over again a phrase rose unbidden to my mind; there but for the Grace of God go I. Suddenly, fighting to get Jack to pet a puppy or eat a piece of squash feels ridiculous compared to this family’s fight to save their son’s life. They promised Nicholas they would race to find a cure for the devil who raged his merciless war inside their young boy’s body. And every single day they woke and faced this devil with grace and compassion, but in the end, they lost the race. However, I do not believe they lost to the devil. Instead, I think the angels prevailed, and with their light feathery touch, they quieted Nicholas’ seizing body and welcomed him into their heavenly arms. 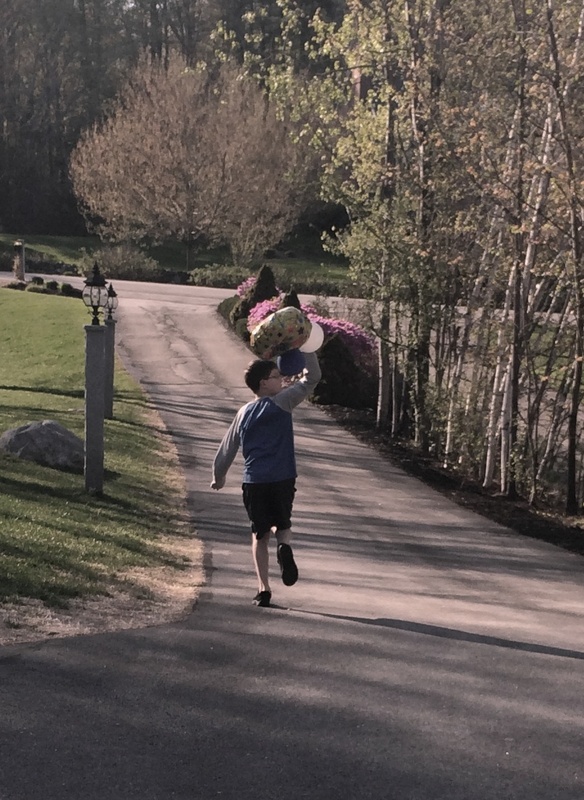 After he got home from school, Jack and I went down the driveway to fasten his balloons to the post. I had Wolfie on the leash and Jack walked ahead of us, stopping every few steps to turn back and call out to the puppy and coax him along. Watching him skip and jump, I promised myself I would continue to be inspired by this family. On those long days when I’m convinced I lost the genetic lottery with autism, I will remind myself that this not a game to win or lose, but a life of love and hope and possibility. I agreed, it was a good day, and I wished him a happy birthday with the one-arm hug he prefers. For the briefest moment he allowed my hand to slide off of his shoulder and reach for his. And standing at the bottom of my driveway with my son’s hand in my own, I quietly wished Nicholas a happy birthday as well. I smiled to think of him dancing and twirling and laughing in the clouds high above, with his fingers and toes at last filled with grace. As we walked back to the house, I looked down to the mailbox once more and watched the balloons floating against the dove gray sky. In so many ways, they were like life itself; delicate and fragile, and full of air and hope and color and light. They are full of promise. Happy belated Birthday to your Jack, Carrie. And thank you Lord, for letting us all see the beautiful grace-filled way this family fought this fight. And for giving us hope as we all continue to race toward a cure for Batten Disease, with them. You make me laugh and cry with seemingly equal ease! An achingly beautiful post. Thank you. Beautiful post and my heart goes out to that family. Carrie, that was absolutely beautiful. Thank you for sharing. And happy belated birthday to your Jack.